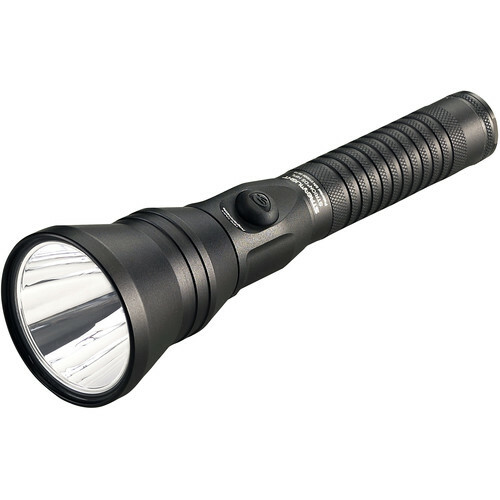 With dual, independent switches providing options for holds and a powerful 700-lumen maximum output, the Streamlight Strion DS HPL Rechargeable LED Flashlight is a versatile tool for law enforcement, professional, recreational, and home use. Its C4 LED delivers brightness levels of 40, 300, and 700 lumens, with runtimes of 20, 3.3, and 1.3 hours, respectively, on a full charge. Push-button switches on the head and tailcap control power on a momentary- or constant-on basis, and the strobe setting can disorient an attacker or signal for help. Streamlight's TEN-TAP programming lets you choose from three modes to suit your needs—high/medium/low with strobe, high only, or high/medium/low. The housing is made of lightweight and durable 6000 series machined aluminum with an impact-resistance rating of 6.6', an IPX4 water-resistance rating, and a lens of scratch- and impact-resistant polycarbonate. The light comes with a 120/100 VAC wall-mountable charger bracket.